Nail polish is a very common item in many households, but even if you don’t use nail polish for its traditional use of painting your nails, there are plenty of other uses that many people aren’t aware of. Being a helpful solution to a variety of problems, in and outside the house, makes nail polish an essential item in everyone’s home. Looking at the history of the popular product, it actually dates back to around 3000 BC (surprising, isn’t it? ), and was initially used to paint nails of royalty members, only later being made available to the public. The nail polish as we know it made an appearance in the 1920s, and by then it came in all kinds of colors. While it’s usually used for beauty purposes, apparently nail polish can be used for many purposes, such as keeping buttons from falling off your shirt, protecting labels from smudging, waterproofing matches, and if you feel like getting crafty – even creating stunning DYI items for your home. 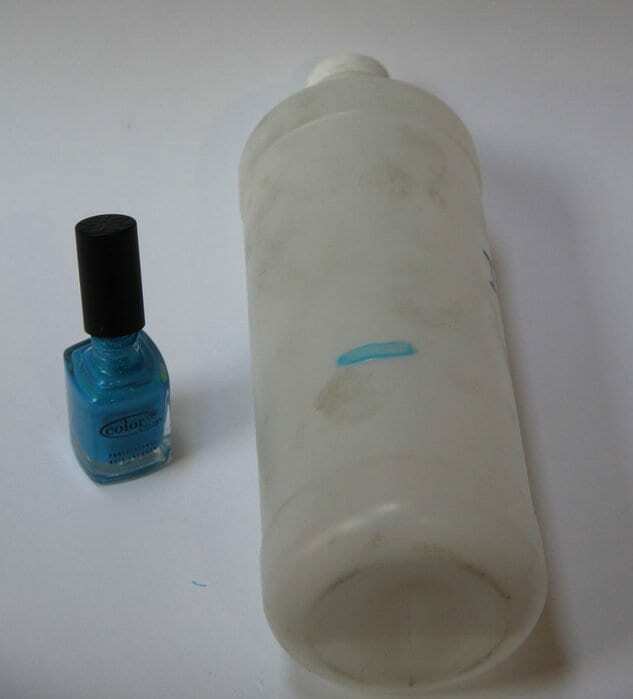 Some of the things nail polish can be used for may surprise you, and perhaps solve you a problem or two around the house. Check out this list to see all of the different uses for nail polish – ones that have probably never crossed your mind. It can be really annoying when one of the buttons on your favorite shirt becomes loose. You know it’s only a matter of time before the button falls off completely if you don’t fix it. It could also potentially create an embarrassment should it fall off at the wrong time, leaving you with an unbuttoned shirt for everyone to see through. If you don’t have the particular set of skills required to sew the button so it stays in its plays, you can actually use nail polish to keep it from falling off. 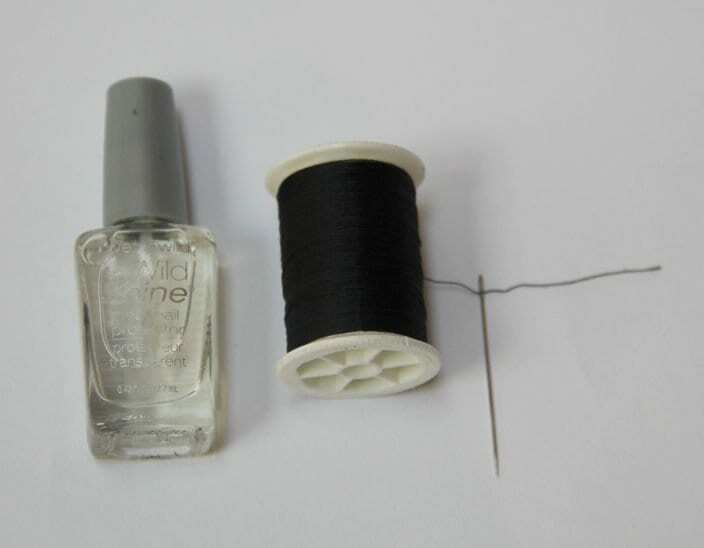 Just use a dab of clear nail polish on top of the button, to keep the thread from unraveling any further. Many people have allergic reactions to nickel, gold, or other metals often used in jewelry. Not only can it irritate the skin and cause a rash, it can sometimes even turn our skin green! Sometimes the jewelry we buy are on the cheaper side, as they can often be very beautiful, and some buttons used in trousers and jeans can also turn the skin green if it comes in contact with it. A helpful thing you can do about this, is coating the insides of the jewelry with some clear nail polish. This should prevent any allergic reactions from happening, and keep your skin from turning green like The Hulk. Most shoelaces and hoodie strings have small clear pieces of plastic at the ends, to keep them from unraveling. But these pieces of plastic eventually fall off or wear out, and we’re left with an exposed lace that might eventually being to disintegrate. To prevent this from occurring, you can paint over the end of the shoelace or string with some clear nail polish, so that they won’t fray. It should keep them intact for a while longer. It’s always a hassle when screws become loose, like the ones in your drywall, or even the small screws on your glasses. 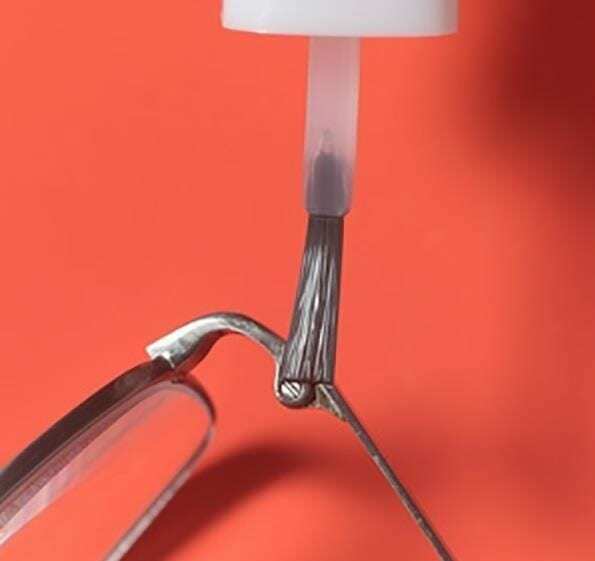 If you’re not exactly feeling up to pulling out the working tools and fixing it properly, you can actually use nail polish as a temporary solution to keep them in place. Or instead, tighten the screws and then paint some nail polish over them to keep them from becoming loose again in the future. Most of us keep metal cans in our bathrooms, whether it’s shaving cream, deodorants, or other hygienic products. But these cans often leave little rings of rust on the side of your sink or in the shower, which can be a real pain to clean up. Instead of cleaning them up, try coating the bottoms of these metal cans with some nail polish. This will keep water away from the bottom and prevent those annoying rust rings from forming. In this day and age, we use our computers and laptops more and more – whether it’s for work, gaming, or even just browsing the web. But since we use it so much, sometimes the letters and numbers on our keyboard keys can begin to wear off. A great solution to keep this from happening is to coat the keys on your keyboard with clear nail polish. You’ll still be able to see all the letters, but they’ll take much longer to wear off. 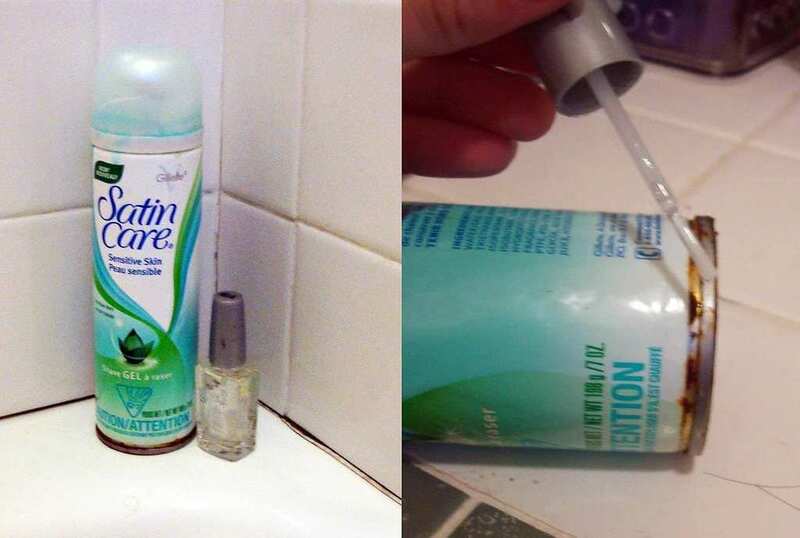 This is a little helpful trick that can be used in a large variety of things. Not many people realize this, but nail polish can actually keep markers and ink on labels from smudging or running. It means that if you have any kind of label that requires protection, you can use nail polish to guard it from smudging. 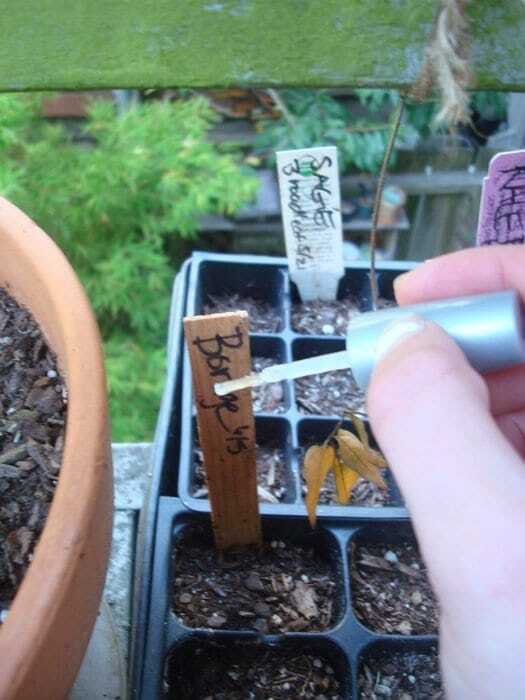 This can be used for labeling plants in your garden, for instance, to keep it from running when it rains or when you water your plants. When your keychain is full of different keys, that are used for different things but look the same, you can actually color code them to keep better track of which key you need to use at any given time. Instead of trying several keys before you find the correct one, you’ll just use the blue key, or the red key. 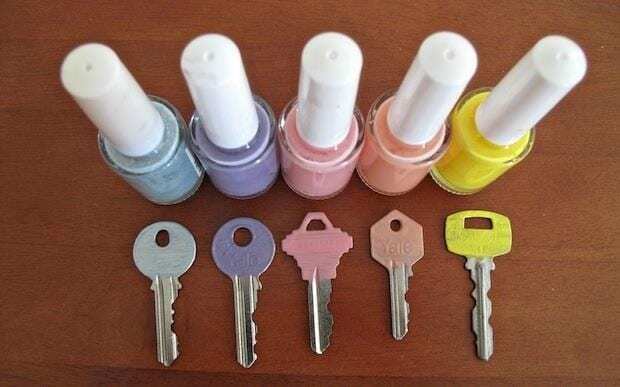 You can also use it to color code keys that belong to different house members, or even color code different items in your house. Let your imagination go wild! 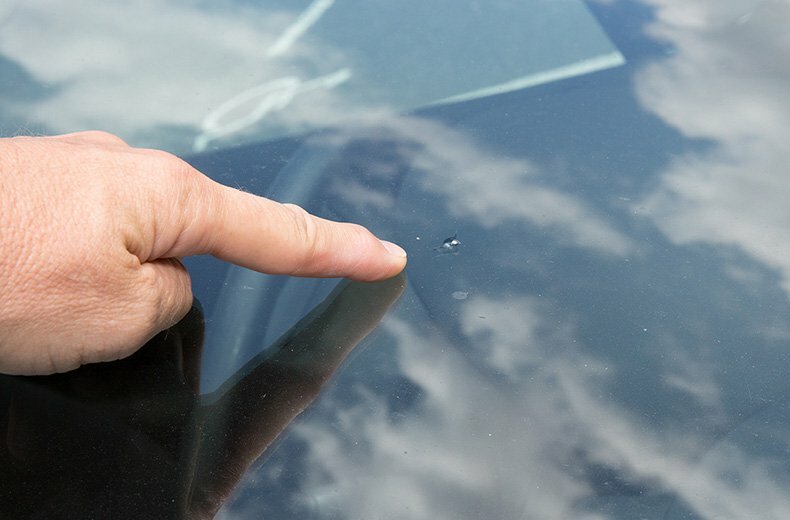 Another possible use for clear nail polish, is to keep small cracks and chips on your windows or the windshield of your car from getting worse. If you put some nail polish on top of the chipped glass, it can prevent the glass from cracking any further – which can be a great temporary fix until you get around to repairing or replacing it. And if you have other chipped glass items you want to keep intact, you can use nail polish for them as well. If you plan on going hiking or camping somewhere, it’s always a good idea to bring some matches along with you. The problem is, if it rains or if you hike through water, your matches could get damp or wet, which would stop them from working properly. 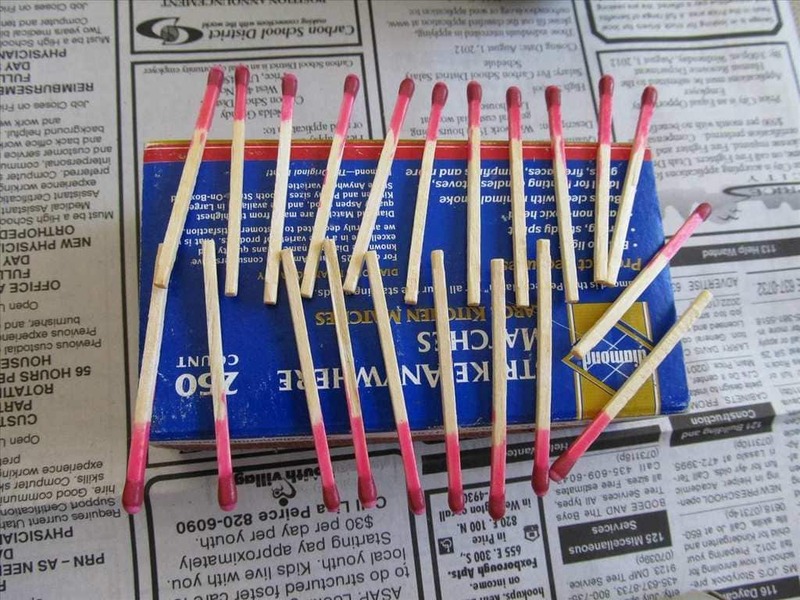 But don’t worry – if you dip the heads of your matches in just a thin coat of clear nail polish, they’ll strike normally when you need them. Just don’t use any nail polish with glitter. Many women know this problem. You’re at work, right before an important meeting, and you find out there’s a run in your tights. It can be really annoying, since even a small run can turn into a huge one. But if you cover it with a little bit of clear nail polish, it will prevent the run in your stocking from being completely ruined at the worst time possible. Try it and you’ll thank us! This use is a little controversial, since most nail polishes have chemicals in them. But you could use a non-toxic brand of nail polish as a replacement from small cuts and wounds, if there’s no other choice around and you’re worried about it getting infected. 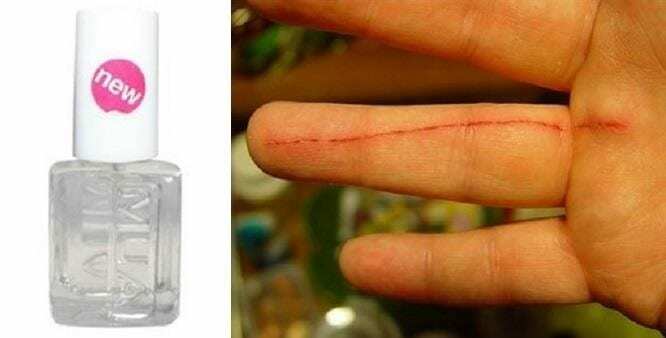 Clearly, it’s not an ideal solution for cuts, as you’d be better using a Band-Aid or Neosporin, but it might be helpful if you’re stuck with no other solution for the problem. Remember that episode in Seinfeld, where George’s fiancée Susan passes away from licking a bunch of poisonous envelopes for their wedding invitations? Well, the scenario in the hilarious show is obviously not very realistic, since envelopes today have glues that are safe to lick. 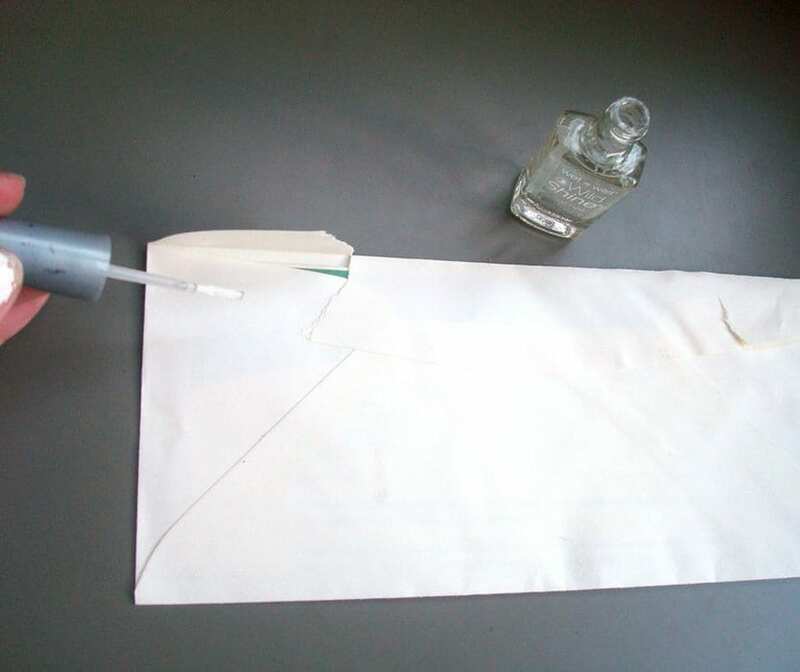 But since it’s not a very pleasant thing to do either way, you can use nail polish as an adhesive, instead of subjecting yourself to that awful glue taste envelopes can have. 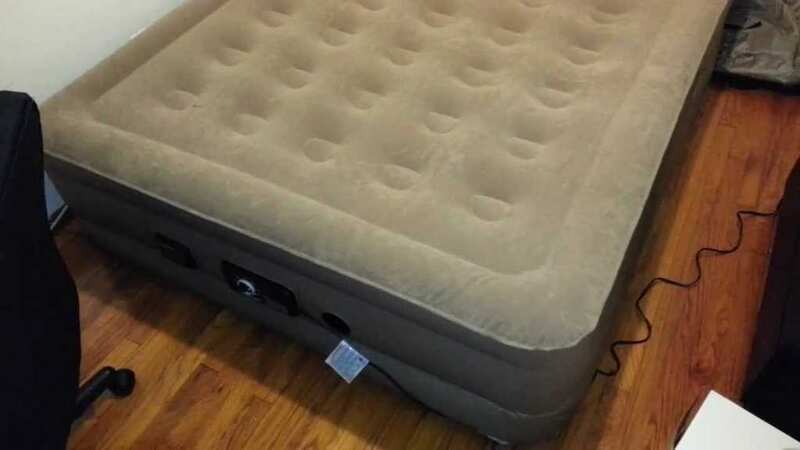 Sometimes air mattresses can get little holes in them, and while they’re usually quite thick – the air can slowly come out of the mattress as it deflates throughout the night. To prevent it from deflating, you can cover up the hole with a small layer of nail polish, let it dry, and then another layer over it (repeat as many times as you see fit). This could prevent the air from leaving the mattress through these pesky little holes. One of the most frustrating things that any human being can experience in their life, is trying to thread a needle. It can get really annoying to try and get a string into a tiny little hole in a needle. So much so, that people might just give up on the whole thing and go to the tailor instead. But apparently, if you dip the end of the thread in just a little bit of nail polish, you’ll be able to thread the needle much more easily. 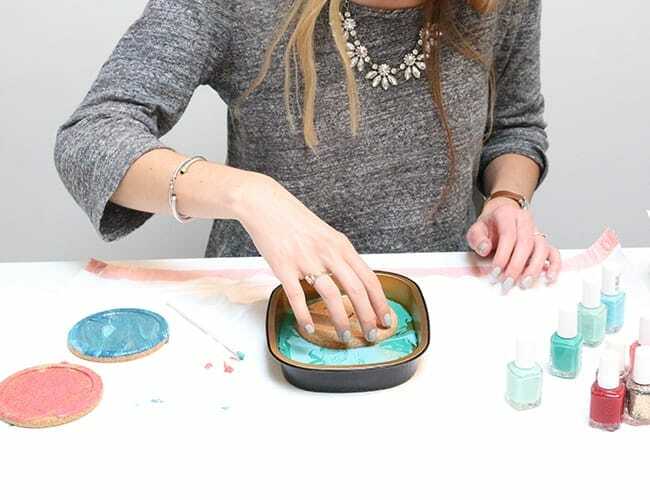 Did you know there are tons of different creative crafts you can use nail polish for? Just try searching “DIY” and “nail polish” on YouTube and you’ll end up with a huge amount of videos for beautiful items you can make for your home, your yard, and even your wardrobe. You can make your own jewelry, create funky magnets for your fridge, and spruce up your shoes, sunglasses, and makeup brushes. The possibilities are endless, so get creative! Another idea for using nail polish around the house, is marking levels and measurements on buckets or cups, or really anything you want. You can mark any clear cup for quantities and create your own custom measuring cup, or you can mark buckets for the amount of soap and water you need for wiping the floors. Since it won’t wear off even if it gets wet, it’s the perfect way of permanently marking levels and amounts on items. We’ve all had something like this happen to us, especially those of us who are prone to injury. Sometimes you hit your finger on a hard surface, and sometimes your nail just goes rogue and cracks. Besides being extremely painful, everything you do can cause the nail to crack even more, leaving your finger exposed beneath it. 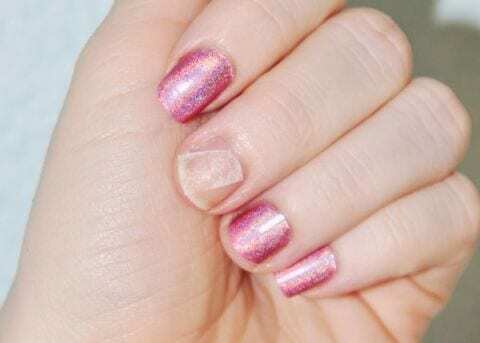 To keep the chipped nail in place and make sure it doesn’t break further, you can put some nail polish on top of it. A common problem with jewelry that has stones in it, is that with time the stones often get loose or even completely fall off. 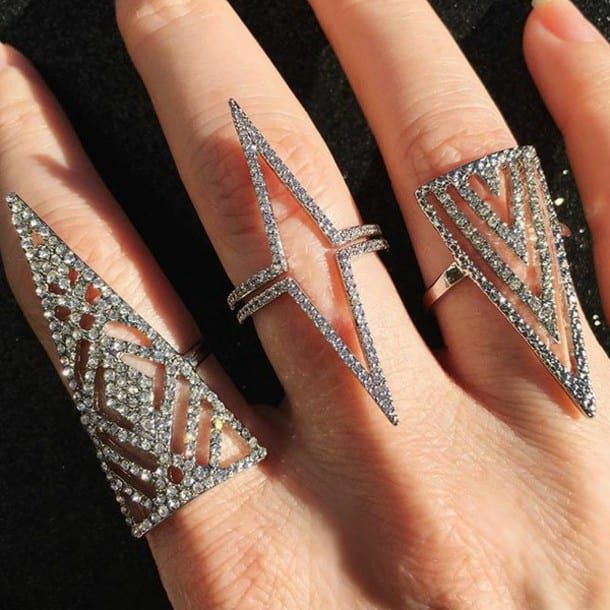 Since not every piece of jewelry is worth going to a professional for, you can fix this at home. After glueing the stone back in its place, you can finish it off with some nail polish on top, to make sure it stays in its place and doesn’t fall off again. 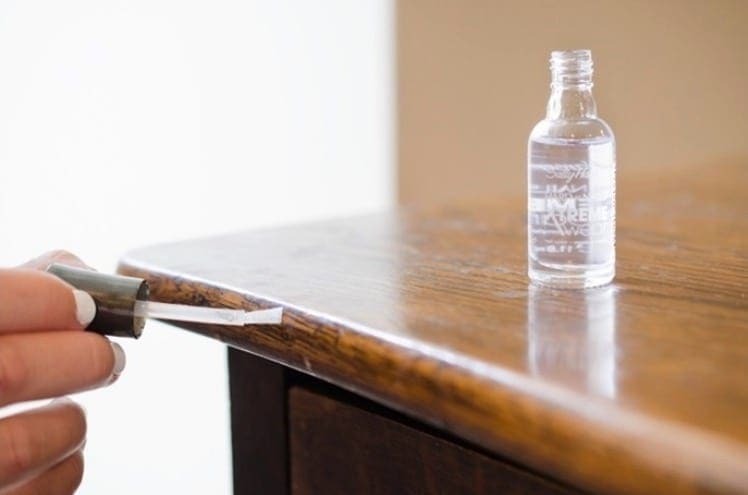 Wooden surfaces often get chipped in some places – especially when they’re not coated in wax – and those hazardous splinters can potentially cause injuries to anyone who touches the wood. To keep this from happening, you can coat parts of the surface with some nail polish (you can even pick a color that matches the wood). If there’s already a splinter, you can remove it and coat the spot with nail polish, which should stop it from getting worse. Forrest Gump came out in 1994, wonder what went on behind the scenes?